Steamboat provides an environment for kids and families learning how to ski with five kid-only lifts in the form of beginner magic carpets, private, full and half-day lessons for the family and kids-only terrain at Rough Rider Basin. Kids can also play on the Beehive-a terrain park dedicated to the youngsters. Feel safe letting the kids ski on their own as Beaver Creek's base village is very pedestrian friendly and self contained. The popular skating rink is the village centerpiece, and much of the lodging is ski-in/ski-out or steps away from a lift. Wind down after a day of skiing by taking an open air sleigh ride to an on-mountain restaurant. Another perk: The resort serves chocolate chip cookies at 3 pm everyday. A few miles south of Glenwood Springs, the sometimes forgotten Sunlight Mountain Resort covers 680 acres of skiable terrain with 67 trails. The friendly and affordable ski resort (average daily lift ticket is $45) is great for beginners, with about 75% of the terrain suitable for teaching. 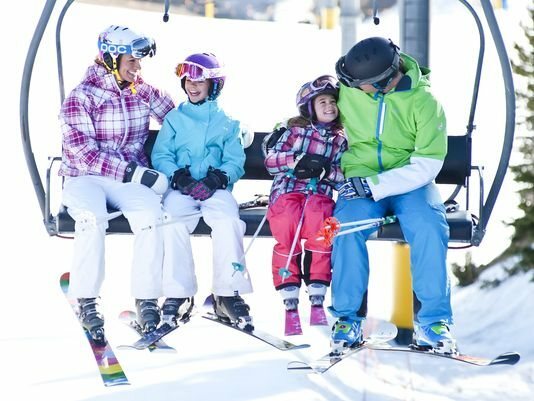 Keystone Resort offers a Kids Ski Free program with no blackout dates, no lift-ticket requirements for adults, and availability on all weekends and holidays, with a two-night minimum stay. The fun starts at Woodward at Copper's Barn, a 19,400-square-foot indoor playground with year-round ski, skateboard and bike programs. The Barn features mini ramps, foam pits and Olympic fly-bed trampolines, and this season, is the hub for all teen lessons. Skiers and snowboarders ages 13-18 begin their day with Copper Ski and Ride School. Copper also has the Alpine Rush Zip Line, which allows two riders to soar side by side 30 feet above the West Lake ice skating rink at speeds up to 30 mph on the 300-foot line.